All adjectives in quotations within this review were used to describe Fiel Garvie in the press sheet put out by their label, Words On Music. I would like to preface this review with a bit of personal reflection. I will hereby admit to having composed ridiculously self-gratifying press sheets for my own bands. There, I said it. Whew! That felt good to get out! Anyway, much like the members of Fiel Garvie, I have been in bands whose press sheets touted them as "enigmatic," "innovative," "fiercely independent," and "unforgettable." 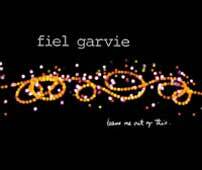 Like my past musical endeavors, Fiel Garvie is truly unworthy of these adjectives. I usually wouldn’t spend this much time and space critiquing a band’s press sheet, but this one is particularly bad. If a band’s press sheet is intended to accurately represent the attitudes and motives of the group, then I can assume that Fiel Garvie is rather over-confident. There are a whopping 39 adjectives in this half-page press sheet, ranging from "delicious" to "extemporaneous" and from "mouth-watering" to "unmatched." They compare themselves to 10 different popular bands, and suggest that a particular track "evokes the best of mid-day Cocteau Twins." Having read this press sheet, I prepared my ears to be treated to what would undoubtedly be a recording of unparalleled brilliance, of cataclysmic future influence! What aural joy I would experience! What "infectious" melodies would I soon be humming perpetually? Ever had Ed McMahon call you up and tell you that you’ve just won tem million dollars and then say, "Just kidding, sucker!" and then hang up on you? No? Well maybe I’m exaggerating a bit, but listening to this disc after reading the press sheet was a bit like that. Needless to say, Fiel Garvie by no means lives up to the hype. With trite lyrics like, "I feel so bad about you / think too much about you / as long as these things remain unsaid," Fiel Garvie reminds me of the bad poetry I once wrote in my spiral notebook in high school. The musicianship is certainly competent, though the songwriting most certainly would not warrant the use of words like "perfectly-crafted." The production of this record is crisp and clear, but, much like clean water sullied by a turd, eventually it is overtaken by the stinkiness of that which it contains. Great production and cool effects can’t make up for the crappy songs. The band’s vocalist has the sort of breathy voice that can either be great or greatly annoying. Mazzy Star can do it. The Cranes pretty much invented it. But, in this case, it comes off sounding like a scary great-aunt whispering something dirty in your ear just before she pinches your cheek and tousles your hair. I could be wrong, but Fiel Garvie’s vocalist just seems to be trying a bit too hard. The press sheet calls her voice "extraordinary," but it is not different in a good way; instead, it’s really quite grating. Aside from having obviously studied early Robert Smith guitar work (perhaps Siouxsie and the Banshees’ Hyaena, to which Mr. Smith leant his guitar talent), Fiel Garvie’s guitar work is nice, if a bit derivative. However, what few strong or interesting points this record possesses are completely ruined by silly lyrics or lame vocal melodies. Apparently this band has been around since 1996 (7 years, by my sundial), and they have released four singles, a 7", an EP, and now a second LP. These guys must be happy doing what they are doing, so good for them. However, from a five piece as old as Fiel Garvie, I would have expected a more "unforgettable" record. My advice: if you want to hear music like this, skip right back to the originators (The Cranes, Cocteau Twins, etc) and forget about Fiel Garvie. You can read the hype straight from Fiel Garvie's own keyboard, as it were.